There were 29 Pedestrian Deaths in Connecticut during the first half of 2018 according to the Governors Highway Safety Association. Accidents closest to New Fairfield are listed below. 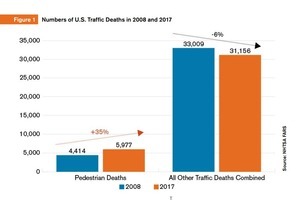 Many factors outside the control of state and local traffic safety officials contribute to annual changes in the number of pedestrian fatalities, including economic conditions, population growth, demographic changes, weather conditions, fuel prices, vehicle miles traveled and the amount of time people spend walking. The increasing shift in U.S. vehicle sales away from passenger cars to light trucks (with light trucks generally causing more severe pedestrian impacts than cars) is also a factor. Although passenger cars are the largest category of vehicles involved in fatal pedestrian crashes, the number of pedestrian fatalities involving SUVs increased at a faster rate — 50 percent – from 2013 to 2017 compared to passenger cars, which increased by 30 percent. Increases in pedestrian fatalities are occurring largely at night. 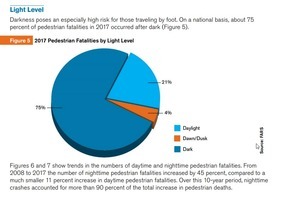 From 2008 to 2017 the number of nighttime pedestrian fatalities increased by 45 percent, compared to a much smaller 11 percent increase in daytime pedestrian fatalities. Another possible factor contributing to the recent rise in the overall number of pedestrian fatalities could be the large growth in smartphone use over the past decade, which can be a significant source of distraction for all road users. According to GHSA, More than one-third of pedestrian fatalities occur on local streets. Pedestrian fatalities during the first half of 2018 declined in 23 states compared with the same period in 2017.ase in daytime pedestrian fatalities. 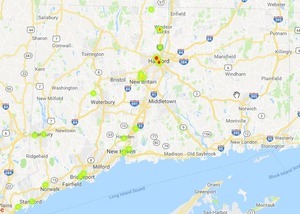 With a rate of .82 Pedestrian Fatalities per 100K population, Connecticut ranks 16th amongst all the states. Connecticut's public information campaign, “Watch for Me CT”, was highlighted as a way to prevent pedestrian fatalities. The “Watch for Me CT” campaign is a statewide educational community outreach campaign involving media components and community engagement in partnership with CT Children’s Medical Center.